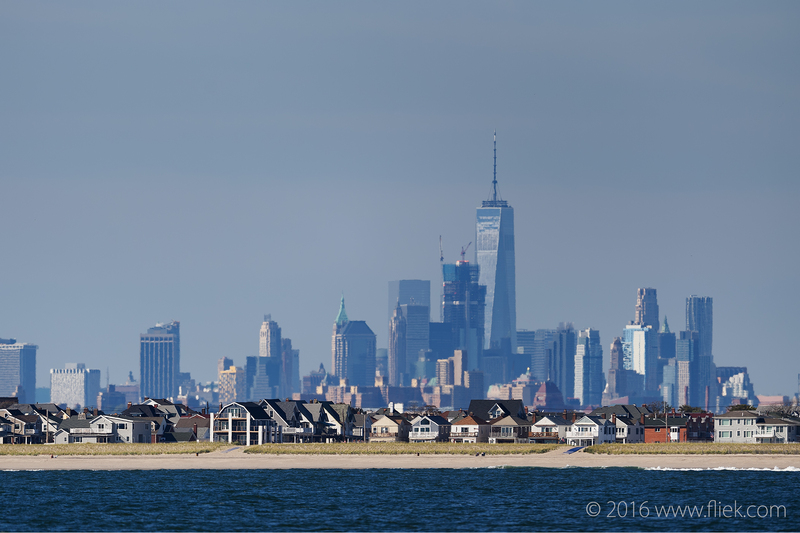 “Low-ISO high dynamic range”, humpback whales, Nikon D4S… and New York? The tours typically start at 12:00 PM (noon) and take about 4 hours: an hour to sail to the viewing spots in the Atlantic and around an hour going back. For photographers this is absolutely the worst possible time to shoot: the sun is at its highest and you’ll get the most unforgiving, harsh light. The differences between light and dark are horrendous. You’ll need seriously professional and therefore expensive super modern/latest sensor to fight blown out highlights and lost darks. And off course, besides all these challenges you also need to be lucky enough to actually encounter one of these amazing creatures! However, after about 3 hours staring at the sea I finally managed to capture the shot below. I had already set my shutter to around 1/2500 and my aperture to f/5.6, just to keep my D4S from overexposing due to the harsh daylight. Such amazing creatures; if they could only be left alone all over the world to be admired all over the world! Anyway, back to the image… This is your typical “low-ISO high dynamic range (DR)” image (perhaps not typical). And under these circumstances, the darks will be as black as a black hole (well almost) and those shiny highlights will destroy any usable information on your sensor. In fact, on my original image the humpback’s tail is completely black and the sea is pretty much white washed. The amazing high dynamic range at low ISOs of the D4S enabled me to retrieve the darks and trim down the highlights, and I managed to retrieve an actual whale from my shot instead of a collection of blacks and whites. 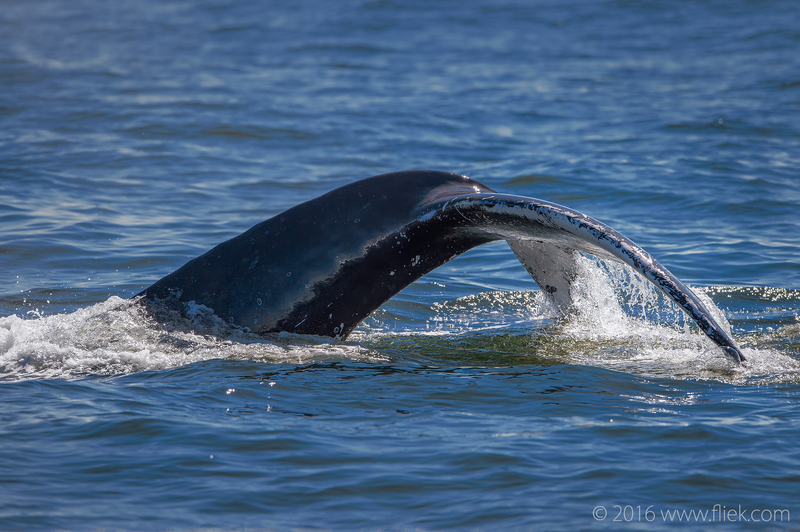 I actually noticed that humpback tails have blues, reds, blacks, greens… amazing! And noise? None (noticeable). Back to the Nikon D4S. As many will know, the D4S has been replaced by the D5. And as I’ve indicated before, it doesn’t hurt to know about the low-ISO high dynamic range of the D5. Much has already been written about it. Nikon has improved upon the D4S in terms of an amazing, and possibly the world’s best autofocus system, an extra 4 megapixels (nice step forward from 16 in the D4S) and another frame/second: not a game changer, and still lagging behind the Canon 1DX(2), but still nice. But would I have been able to capture the same shot with the D5 as with my D4S, after processing? I honestly don’t think so. Why? Have a look here: Nikon D5 has lowest base ISO dynamic range of any current FF Nikon DSLR. I was quite shocked the first time I read this article on DPReview (as I was really intent on upgrading), and I must admit I’m still quite surprised about the reactions on the Internet about D5 buyers and how most of them “shoot high ISO anyway so it doesn’t matter…”. For a camera that’s about $/EUR 1000 more than a D4S (I’m not joking: the D5 goes for EUR 7100 retail in The Netherlands – seriously) and has such poor DR I can only say that there’s no way I could have taken a similar shot of my little humpback as I have: the DR of the D5 wouldn’t have been sufficient for the job. I think your article does hit a nerve with a lot of “potential” D5 shooters…. …but you are mistaken concerning the D4s. The D4s is not isoless and doesn’t hold up well in comparison to a D810/D750/D7200/D500 (I have tested all of this cameras myself). …but I don’t see that as a limiting factor, even though I shoot mostly wildlife (also with the 600 FL -> thanks for thesuperb articles on that one ;-) ). You’re spot on about the D750/D810: I have a D750 myself and the IQ/DR is just stellar. If only Nikon would make a D750 that would shoot 12 frames/second: I’d sell my D4S yesterday. I’ve been contemplating on getting the D500 for some time and your ISO/DR experience is pushing me even further. and select D4S, D500, and D750 for example. You’ll see there’s a significant difference between the D750 and D4S (and even more compared to the D5…) but not so much between the D500 and the D4S, which kinda makes sense due to the difference in sensor & pixel sizes. In fact, after ISO 159 the D4S outperforms the D500 in DR. Still, the D500 is a very attractive addition due to the 1.5 crop factor. And attached to the 600mm…what a combo! Take it from somebody that has both the D4s and D500…. …it’s dangerous to have both! The D500 and 600FL do in fact make an exceptional combo (try it with the TC20-iii if you can). The D500 is so good (specially the AF) that you will start to miss that and other things when you use the D4s and start to wish you had an D5. Regarding the DR I advise caution.